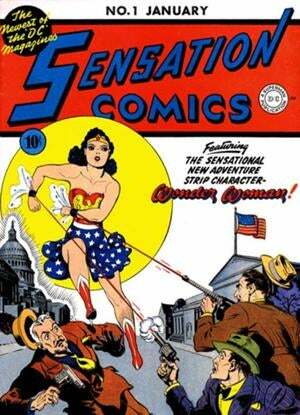 On a crisp winter afternoon in 1942, an 11-year-old girl plopped a dime onto the counter of a drug store in rural Tennessee and bought the first issue of Wonder Woman's very own comic book. (Or maybe not. Maybe her father, who was known to read the occasional pulp magazine, got it for her. The specific details don't really matter. But in my imagination, she buys it herself with a shiny new Mercury dime and a big grin on her face.) In my mind, I see her rushing home and plopping down on her bed to avidly read the brand new adventures of Diana Prince and Steve Trevor and Etta Candy, then go on to devour all the back-up features like Wildcat (first appearance!) and Little Boy Blue and the Blue Boys. And I feel her dismay when, not too long afterwards, her mother throws it out while cleaning, along with some early issues of Action Comics and Airboy and who knows what other treasures. But she kept on buying her "trash", graduating eventually to the SF pulps like Astounding and Worlds of If, and Ballantine paperbacks and Ace Double Novels and Doubleday's Science Fiction Book Club. Her love of science fiction and fantasy thrived and grew for her whole life. Her name was Betty, and she was my Mom. I grew up surrounded by books and magazines. There were bookshelves in the living room and my parents' bedroom and in the short connecting space between the kitchen and dining area, all stuffed full of Ace and Ballantine and Bantam and Dell and Pocket paperback originals, and the aforementioned SFBC "sort-of" hardcovers, the sweetest deal ever for SF/Fantasy readers on a budget (4 books for a buck, and you only had to buy four more in the next year — unless you forgot to mail in the card that told them you didn't want this month's selection sent automatically, which we were constantly doing). Even our closet and pantry shelves were full of stacks of old issues of Analog and Galaxy and Fantastic and The Magazine of Fantasy and Science Fiction. By age three I was already thoroughly imprinted with Chesley Bonestell cover art and old book smell. Even before I learned to read, I would sit on the floor in front of one of those shelves for hours on end, completely mesmerized by the likes of Frank Frazetta and Kelly Freas on the dust jackets. Robots! Spaceships! Martian princesses! BEMs! I wanted to figure out this "squiggly marks on paper" stuff fast, so I could learn the stories behind all these cool pictures! I honestly don't remember what my first genre short story was about. I'm sure it had to have been something in one of the many omnibus collections Mama owned. I would read them with our big old Random House unabridged dictionary at the ready, in case I ran into a word I didn't know. I do remember the first "grown-up" novel I read all the way through. It was The Door Into Summer by Robert A. Heinlein. It had a very personable cat in it, which was a plus — I liked cats. (I would realize much later that Pete was a more fully-drawn character than the book's narrator, in fact.) It's pretty dated now (heck, it was dated when I first read it — it begins in 1970, and I was pretty sure we wouldn't be getting cryogenic sleep and helper robots in just two or three years), and it's minor Heinlein. But it's a fun read, and the way the (spoilers, I guess) time travel plot worked out to every tiny detail with no paradoxes croggled my seven-or-eight-year-old brain. On the plus side, funnybooks were still 12 cents a pop when I started reading, so my $1 allowance went a long way! And if I happened to be sick and couldn't make it to the store on Thursday, Mama would usually pick me up half a dozen or so before coming home from work. The pictured issue of Adventure is from one of those times, and I remember it fondly — Superboy, Mon-El, Shadow Lass and Duo Damsel have to flee the sorcerer Mordru by travelling back in time to 20th Century Smallville. Written by a 16-year-old Jim Shooter! And then there was TV. We had an old black-and-white Zenith (the channel knob fell off eventually, and we had to change stations with a pair of pliers) and no cable till the mid-70s, so we were limited to the local NBC, CBS, ABC and PBS affiliates. But we watched everything even remotely genre-related, including the crappy stuff. There were syndicated reruns of The Twilight Zone and The Outer Limits, of course (and later, Night Gallery). There were the sometimes cool, sometimes schlocky Irwin Allen series like Voyage to the Bottom of the Sea and Land of the Giants and The Time Tunnel. There were The Addams Family and The Munsters. There were Secret Agent and The Prisoner (Mama and I suspected that Patrick McGoohan was supposed to be the same character in both series). There was Batman, which she hated (although she did like Eartha Kitt as Catwoman — I preferred Julie Newmar). And there were the really silly genre comedies like It's About Time and Captain Nice and My Living Doll (Julie Newmar as a robot in a bikini, which was high-concept enough for me even as a pre-pubescent!). (Also My Favorite Martian, which doesn't count as silly because Ray Walston was cool.) And too many Saturday morning cartoons to list (I was a big fan of The Herculoids and Jonny Quest in particular). Yes, children, I got to watch Star Trek while it was airing first-run on network television. And Mama was in heaven over it. A serious SF series that wasn't an anthology show, with scripts written by actual genre authors like Theodore Sturgeon and Harlan Ellison and Robert Bloch and David Gerrold (at least in the first two seasons)! We kind of went a bit overboard in our love for the show. We had dogs named Spock and Sulu and a cat named Kirk. We bought two Leonard Nimoy albums. I had a Star Trek lunch box and the AMT model kits for the Enterprise and the Klingon Battle Cruiser. And, even though we weren't "fan" fans (the convention scene at the time was limited to a few large cities, and we wouldn't have had the money or the means to go, regardless), we participated in both write-in campaigns to save the show from cancellation. We were both devastated when it finally went off the air, even though it was obvious to a nine-year-old the quality of the writing had gone way down. There were other shows on, like Lost in Space (which actually started out as a fairly serious drama before it turned into the campy but still entertaining "Doctor Smith and Will and The Robot" show) and, later, the original Battlestar Galactica (fun and cheesy and a pretty brazen rip-off of a certain megahit movie). But it just wasn't the same without Trek. I don't think there's any way to get across to a modern audience how Star Wars completely took over popular culture that year. (And I'm sorry, but screw that "Episode IV: A New Hope" crap, it's Star Wars.) Even in my own small town, people were lined up around two blocks to see it, some for the fifth or tenth time. (We saw it twice, I think.) Darth Vader appeared on The Midnight Special with Wolfman Jack! For once, the mundanes weren't making fun of "that sci-fi stuff", they were eating it up, and it was crazy and wonderful. And it wasn't even particularly great "sci-fi stuff". It was 1930s space opera, pure and simple. But the genius thing George Lucas did was to take a Republic serial and turn it into spectacle. That clip above, where the Imperial ship keeps coming and coming and coming into the frame, literally had people gasping in the audience. Mama said later that she'd read the cantina scene a dozen different times, but she never expected to actually see it. Everybody who was into "that sci-fi stuff" said that. I'm glad she got to see it. Mama passed away the very next year, too suddenly and far too soon. She got to see Star Wars, but she missed The Empire Strikes Back, which she would have loved (not the least because one of her favorite writers, Leigh Brackett, had a hand in developing the script). And Superman. And Raiders of the Lost Ark. And the Star Trek films. And I'm typing this with tears in my eyes, and thinking that's a silly thing to be getting emotional over. Only it isn't. It isn't silly at all. Even now, over 35 years on, I'll be reading a good book or watching a good film or TV show and catch myself thinking, "She would have loved this." I won't start listing them here; if I did, I don't think I could ever stop. And that 11-year-old girl rushing home with a copy of Sensation Comics #1 clutched tightly in her hands would have loved this, too: we are living in science fiction now. We have a space station. It isn't a pinwheeling 2001-type construction or an O'Neill cylinder, as she would have preferred, but it's up there and it's a good start. We have robots tooling around on Mars. You probably have a combination communicator/tricorder in your pocket or purse right now, with a chip inside it more powerful than the computer that guided the first astronauts to the Moon. I'm typing this right now on a machine just as powerful, painting my words on a liquid crystal canvas, and when I hit "Publish" it may be read on similar magic screens by people half a world away. Yes, things are still pretty bad for too many people. But on the whole, the world is a better place than it has ever been in our whole history. Three steps forward and two steps back, but we still advance. We still dream. We still hope. Thank you for my love of reading and learning. Thank you for encouraging me to think and create. Thank you for letting me stay up to watch my first lunar eclipse and the Apollo 11 landing (though you would have shaken me awake for that last, regardless). Thank you for Isaac Asimov and James Tiptree, Jr. and Roger Zelazny. For The Lord of the Rings and More Than Human and The Martian Chronicles. For "Jeffty is Five" and "The Nine Billion Names of God" and "A Case of Conscience". For Doc Savage and Retief and the Gray Mouser. For the Batcave and the Fortress of Solitude and Paradise Island. For Forbidden Planet and The Bride of Frankenstein and The Day The Earth Stood Still. Thank you for giving me the worlds.